Here's another little neat thing I did with limited pieces. 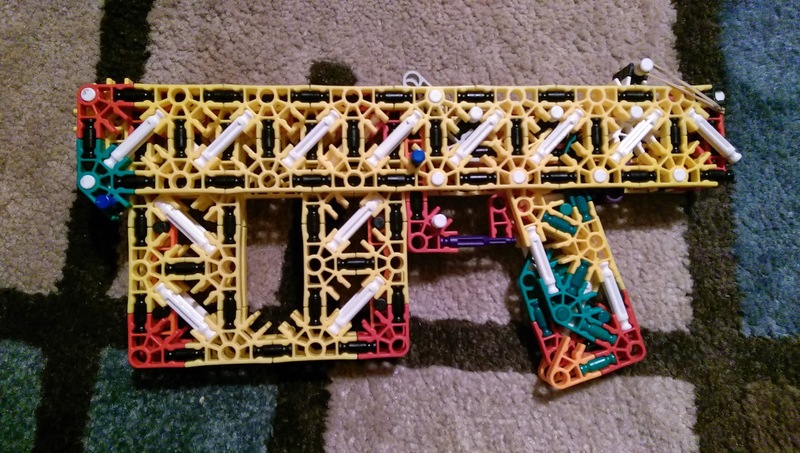 The gist is that I learned two things at the time from other builders and wanted to apply them.One was how to make a slick yellow-rod sized magazine. The other was an easy way to make white rod magazines removable. 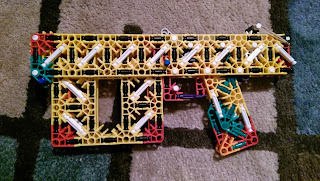 So, I combined the two ideas to make a removable magazine for yellow rods, though I ended up using connector-based ammo for reliability. I made a simple launcher just for the sake of demonstrating the magazines. I fixed up the design to make it a little more post-worthy. I had so few pieces I couldn't even fill in the stock, but I kinda like the look regardless. It was a charmingly simple launcher. One other neat little trick was thanks to how simple the magazine connection method was, I could also do that for the stock as well to store a spare magazine in it. Because I had so few pieces, I requested that someone else spruce up the design and post it for me, so there are instructions here thanks to user travw. It was a modest build overall. The magazines were neat, but only held 5/8 rounds depending on the length you built, and this was a time when bolt actions and turrets were becoming popular, so its range was very lacking. That said, it still gained some appreciation, and user bakenbitz (now GrandeSwag on Instructables) used it as the base for a functioning Barrett M107 model, which was pretty cool. I've often thought about revisiting this design because the building methods are dated but the principle is still there: I'd love to have a simple launcher with a large magazine just for fun. I did start on something some time ago using the base of my DERP launcher, but I didn't like where it was going for a handful of reasons, one being that it was no longer really that simple yet it didn't really offer any advantages over a bolt action launcher. That said, I like the design, so I've considered remaking it but using "shells". The idea of a shell is to encase a projectile so that it's not in contact with other projectiles, thus avoiding the magazine friction problem that direct-feed repeaters like the BAW have. The magazine lends itself well to having shelled projectiles. Actually, while I'm at it (sorry, this post is another run on one... I appreciate anyone still sticking through to the end! ), I'll show an even older launcher that was sort of a precursor to the BAW before I figured out the nice way to make a removable magazine. It used shelled ammo. Again, I was horribly lacking in pieces so it didn't have a stock, and it was very crude. The shelled concept actually worked out quite nicely except the shells didn't eject automatically, so I had a little plunger on the side for manually ejecting them. I didn't keep it around for long since I didn't like how crude it was. It did give me hope that shelled ammo had potential. So who knows, perhaps I'll revisit the BAW + shelled ammo concept soon.